Prom is the second album from the avant-garde experimentalist trio known as Grooms. There’s much to enjoy here for the 21st century music lover. A juicy, rich collection of sounds in the vein of Sonic Youth with a dash of Animal Collective, Prom clocks in at just over thirty minutes but is overflowing with texture and substance. If this thing were a dessert, it would be an ooey, gooey, delicious mess leaving scattered crumbs in its wake. 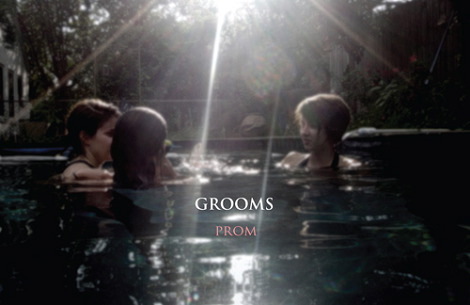 Prom is built for exploration via replay value. It feels huge to be so brief and it rewards subsequent listens with the reveal of subtle hooks and melodies the listener may have initially overlooked within the sonic hubbub. Grooms opts for a tastefully subtle but undeniably present distorted reverb that lends clarity to Prom's thematic darkness. The album peaks early with “Tiger Trees” and the self-titled second track “Prom”- a song with a chorus that vaguely recalls John Williams’ 1991 score from Hook. The tracklist levels off from this point forward as one tune flows into another without a significant dip in quality. If a flaw is apparent, it is that most of Prom feels familiar. It insists on making an impact without taking chances. While this is a perfectly acceptable artistic decision that has lead to countless healthy musical careers, Grooms are awesome enough to really up the ante with their music. Here’s hoping they realize that for the next time out. The world can always use another masterpiece- and these guys obviously have it in them.